Shopgirl Jen: GET YOUR KIDS TO LOVE MATH WITH S. A. M.
GET YOUR KIDS TO LOVE MATH WITH S. A. M.
Filipino kids are no different from their peers in many parts of the world who feel intimidated by math. As it is an exact science, there is no way to go around it but face it head on. But Filipino kids can now tackle math problems with relative ease- with the entry of Seriously Addictive Mathematics or S.A.M. into the local scene. 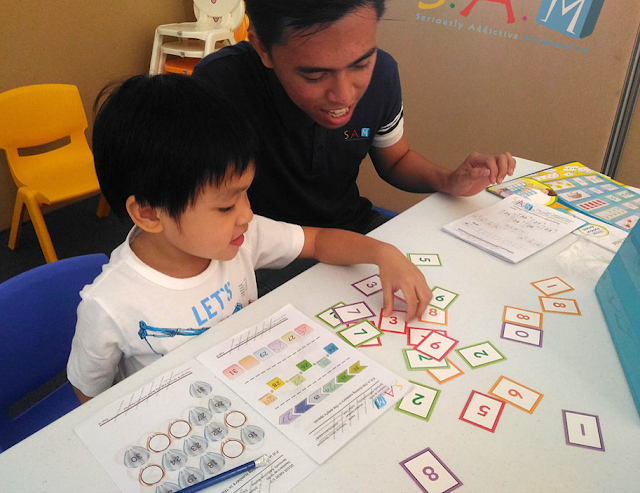 Founded in 2010 by Samuel Chia and Lau Chin Loong, S.A.M is a multi-awarded international Singapore math enrichment program trusted by thousands of parents in 16 countries all over the world. A graduate of the National Institute of Education in Singapore, Chin Loong created the curriculum of S.A.M. and consulted Marshall Cavendish, a provider for academic resources and publishing company of some of the Singapore Math textbooks used in the Philippines, to ensure that kids receive world class materials. Enrich Asia was the one who brought S.A.M. here in the Philippines, after searching the globe for the best educational program that will be useful to kids. Traditional math also immediately tackles abstract ideas- using symbols and jargons while S.A.M. moves from a concrete then to a visual and pictorial presentation of concepts before getting into abstractions. 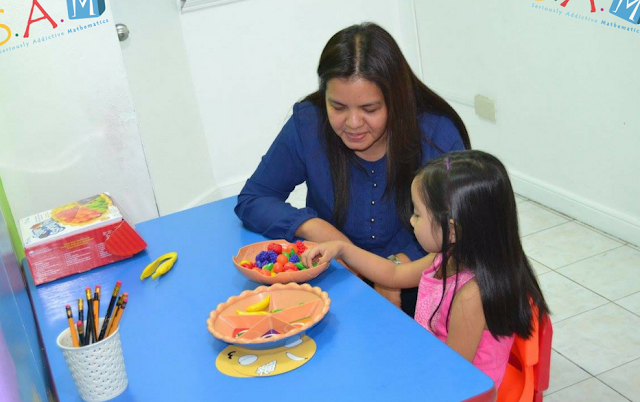 The program Filipino kids have grown accustomed to focuses on mathematical procedures and formulas. S.A.M., on the other hand, zeroes in on conceptual understanding of topics so students would know how the procedures came to be which is needed to help them discover the formulas on their own. In conventional math, pure equations are used to solve word problems. In S.A.M. the bar-model approach is employed. This allows a student to develop their visualization skills which they would need in solving complex word problems without using algebra. During this engagement time, S.A.M.’s trainers also takes the opportunity to evaluate how the student is coping with his work, his rate of progress and his level of motivation. By assessing each and every student’s learning ability, the trainer can adjust their mentoring approach to suit the needs of the student- so the pace is neither too fast nor too slow. Each student receives a personalized learning plan so that the student can learn at his or her own pace and ability. S.A.M Trainers understand that their role is not just to instill Mathematical knowledge in students, but to also inculcate the right learning attitude and self-discipline in them, in preparation for their future.